Sports Costs > How Much Does a Football Helmet Cost? How Much Does a Football Helmet Cost? The football helmet is the critical piece of protective equipment worn by football players in a game or in practice, providing protection to the head from sudden impact that can lead to serious injuries. Football helmets vary in size and design, depending on the preference of those who buy one. These helmets are usually made with padded leather, and the average football helmet will have bars that protect the face and a visor to protect the eyes from glare. The price of a football helmet will depend on the brand, the type, and where you purchase it from. On average, a football helmet can cost anywhere from $45 used to as much as $400 brand new. Varsity helmets, on average, will cost about 30 percent more than a youth helmet. For instance, at Riddell, the average varsity helmet retails for $279 to $425, while the average youth helmet retails for $109 to $200. According to this CBS Sports article, Baylor University spent $600 to $700 per college football helmet, while Mississippi State spent close to $600 per helmet. Business Insider says the University of Nebraska spends about $340 on their helmets, including the decals. For example, a simple recruit helmet with nothing on it, such as the Recruit YFS, can retail for $35 to $50, while the Shutt Youth ION helmet that has a different type of cushioning compared to most other football helmets retails for $250 to $300. Replica professional helmets that are often purchased for autographs can cost anywhere from $50 to as much as $200, depending on the brand and the team logo. For example, this New England Patriots football helmet can start at $90. Mini helmets can start at $15 and go up to as much as $150 for a replica design. For example, the popular mini VSR4 football helmet can retail for about $30 to $50. Painting a helmet with a customized color can cost an additional $35 to $75 per helmet, depending on the paint colors. Customizing the facemask design can cost another $35 to $65. Decals and stickers that can be added to the helmet can cost anywhere from $5 to $30 depending on what kind of decals are purchased. Helmet reconditioning, which may be needed in the future, will keep the helmet looking like new. Reconditioning often costs about $20 to $30 per helmet. 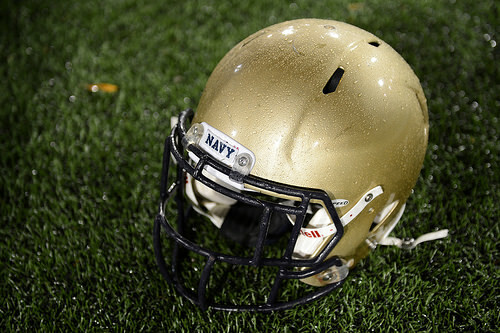 Most football helmets will either have a standard, matte or metallic finish. As for colors, the options are endless since most schools that purchase them will have them painted or customized to match the school colors. If purchased blank, the helmet will either be a plain white or black. Popular brands include GameBreaker, Riddell, Schutt and Xenith. A properly fitted football helmet is important to make sure it’s not uncomfortable or too loose. Refer to this football helmet size chart to see what size you may need. Used football helmets can often be found online or through retailers such as Play it Again Sports. While it doesn’t hurt, look for coupons before making a purchase, especially if doing it through the official retailer’s website. If buying bulk, most manufacturers will offer discounts, up to a certain percentage off.